If you don’t stay up late because you just can’t bear to miss one second of the OneManParty in the Morning I say thank you! In return, I offer you the best of what happens when you are in la-la land. 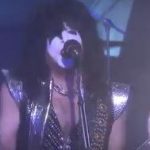 KISS was on Jimmy Fallon last night performing “Love Gun”. KISS rocks Omaha – Thurs, March 7…you’re welcome!